Bangladesh has urged all WHO member states to approve the autism resolution in the ongoing world health assembly that began on Monday in Geneva. Health Minister Mohammed Nasim made the appeal on Tuesday in his speech in the assembly. The World Health Organisation’s Executive Board ‘unanimously’ accepted the resolution placed by Bangladesh last year, clearing the way for its placement in this general assembly for final approval. The WHO annual assembly, where all 194 member states convene, is its supreme decision-making body. The 34-member Executive Board, elected by the member states, forwards resolutions agreed on to the Assembly for approval. The board meeting is held twice a year – first in January and a shorter one soon after the May assembly. 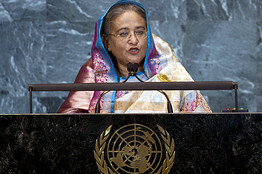 The Bangladesh resolution got the board clearance in May last year. The health minister on Tuesday told the member states that 54 countries had backed the resolution urging “comprehensive and coordinated efforts” for the management of autism spectrum disorder. He called upon everyone to support the resolution for the future of those special kids. “It is fair that we adopt this resolution in this assembly and, thereby, set up a clear roadmap for future leadership in alleviating socio-economic burden as well as tremendous sufferings of the millions of children affected by autism globally”. Bangladesh is globally known for its campaign for the well-being of autistic children. Owing to its initiative, the United Nations and the Regional Committee Meeting of South East Asian Region of WHO had earlier adopted two resolutions on autism. Prime Minister Sheikh Hasina’s daughter, Saima Wazed Hossain, who is a US-licensed school psychologist, spearheads the campaign. She is also accompanying the minister in the assembly. Once passed, autism would get ‘a priority’ in every country. Former health minister AFM Ruhal Haque, who placed the resolution in the board meeting last year, had said WHO would recognise autism as ‘one of the mainstream medical problems’, if the resolution is approved. Autism appears in the first three years of life, and affects the brain’s normal development, hampering social and communication skills. Those who suffer cannot pick up self-care tasks – dressing, self-feeding, using toilet and others – by watching and imitating. They do not make eye contact and have a single-track thought process. But due to lack of trained manpower, many countries, particularly the developing ones, miss early diagnosis, aggravating their sufferings. Many countries, mostly those of South Asia including Bangladesh, do not even know the extent of the disorder. But a latest US study finds one in every 68 children to be autistic - a rate 30 percent higher than what it was three years ago. Editor: it seems like there is little or no prospect that Australia would lead anything like this for autism.